The latest releases from Objective3D and Stratasys are set to help dental labs make the leap to advanced digital dentistry allowing them to service their customers faster, consistently and more accurately than ever before. 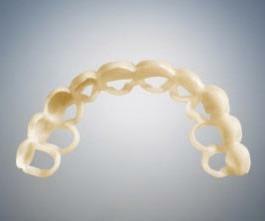 Two new dental specific 3D printing items have changed the way 3D Printing and Dentsitry integrate. The Objet Eden260V Dental Advantage 3D Printer for dental and orthodontic labs; and VeroGlaze, a dental material for natural looking dental models with A2 teeth color shade, plus fine details and resolution are the newest releases from Objective3D and Stratasys and are set to help dental labs make the leap to advanced digital dentistry and service their customers faster, consistently and more accurately than ever before. 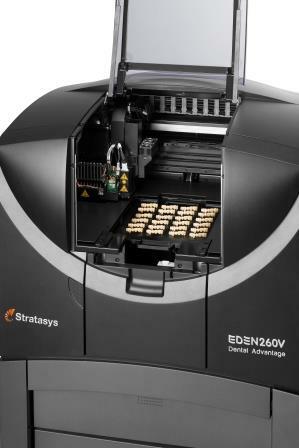 The new Objet Eden260V Dental Advantage 3D Printer provides a lower cost entry to advanced digital dentistry. This means labs can rapidly produce dental and orthodontic appliances, replacing time-consuming manual models and model-making with intraoral scanner output and 3D printing. "The Objet Eden260V Dental Advantage can create a wide range of dental models, surgical guides, positioning trays and orthodontic appliances significantly faster than hand milling, and can also be used to 3D print many different models all at once on a build tray that’s 20% to 40% larger than alternative digital dental systems." This is a clear advantage for increasing production capacity and operational costs, especially since no indepth special skills or computing knowledge are needed by technicians to run it. But speed isn’t the only benefit of the Objet Eden260V Dental Advantage, it also produces accurate and consistent models. 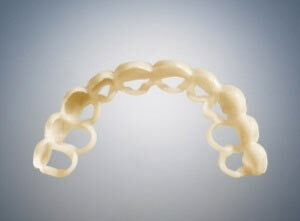 VeroGlaze is a new dental specific Objet PolyJet material for precise A2 teeth colour shade for a more natural look. It can be used in conjunction with all open intra-oral, impression and plaster scanners and is optimised or 3D printing models for crowns, bridge restorations, diagnostic wax-ups and veneer try-in. "Apearance and accuracy are everything in our business and we're delighted with the details and resolution of the models being produced on our Objet Eden260V 3D Printer with the new VeroGlaze," says Yves Dossche, manager of Remedent in Belgium, a leading manufacturer of veneers for the dental industry. With these new introductions, there's no better time to make the move into digital dentistry. To speak to your local award-winning Stratasys distributor contact Objective3D. For a free sample dental model, click here.